How Much Of A Beating Can These High-Quality Room Dividers Take? Each divider has self-leveling ball bearing casters, so when somebody is moving it across the floor, it rises and dips along with the changes in the floor. And there’s no such thing as a perfectly level floor. We also use 14 gauge steel, not aluminum to make our durable room dividers. 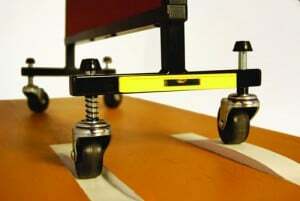 Our end frame and gusset plates add great stability and strength. And each freestanding units, corner caster has a load level of 200 pounds. We use full-length hinges, and that’s very important for safety. The style of hinge we use is based on one that was originally designed for a piano lid, and we have adapted the concept for our room dividers. This type of hinge evenly distributes the weight. This is so it doesn’t place a strain on any of part of the panel. To make sure it will always hold up, we strengthen its connection to the panel with screws placed every four inches. The hinges on our longest and tallest portable room divider, 8′ H X 24′ W, has 550 connecting points just along the hinges alone. This ensures every divider that leaves our factory meets the high-quality room dividers checklist. We also use powder coated paint, which is denser than regular paint and resists scratches.